This is the first ever epic set on the planet Uranus. Stid: I'm not in a position to contradict you since I certainly have not heard of any other novel, epic or no, set on that planet. Zendexor: It's actually not a novel but a series of six novellas, prefaced by a "Brief History of Ooranye". Stid: Hmm... interesting, but I'm not sure about your term "epic". I mean I'm not sure it counts as an epic, if it isn't a unified tale. Stid: Is this a sort of intellectualised Barsoom - a Poul Anderson romp? Zendexor: Gibson is far behind Anderson in his knowledge of science, though somewhat in front of Burroughs. If that's what you're getting at. 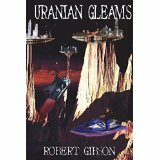 To me the point of Uranian Gleams is that it captures the spirit of those Frank R Paul pictures; his "A City on Uranus" has nothing to do with Gibson's book except in the most general sense, that it is a city on Uranus, but that's enough. 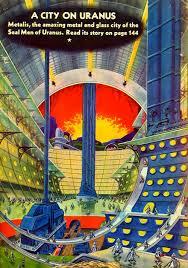 (For more on Uranian cities, click here.) The seventh planet's cultural blank is at last being coloured in, with a civilization. Harlei: My guess is, Stid is getting at the question, whether Uranian Gleams is, at heart, a kind of sword-and-planet book, or whether it's more towards the philosophical, Stapledonian end of the spectrum. Zendexor: You've put me on the spot there. Let me think. Sword-and-planet... (better, "laser-and-planet" because the laser sponnd, which can be fired in either blade or bolt mode, is the favoured weapon of the Uranians)... Now it's my turn to say "hmm..."
You're asking, is it a think-book or an action-romp? Depends... On the one hand, Gibson seems uninterested in violence as a plot-sustainer. His characters are much keener to explore and to browse the world's mysteries, than to fight. On the other hand, they are ready to fight at need - at a moment's notice - and everyone goes about armed, as on Barsoom. The more I think about it, the more I am inclined to agree that Ooranye is an intellectually weighted Barsoom, insofar as on both worlds the essence of life is to get on your flier and zoom through the air in search of adventure - different though the adventures are. And this trend of thought brings me to a surprising conclusion, which is, that in one important respect, Ooranye could be said to be even "more Barsoomian than Barsoom". The heroes of Barsoom are often zooming off in their flyers, sure - but they usually need an excuse, for example a princess has been kidnapped and needs rescuing. Admittedly John Carter in the first part of Llana of Gathol is simply going for a spin in his flyer because he feels like it, but more usually there's an event that has pushed him into it. Not so on Ooranye. Here we have a more constant motivation for flyer-errantry. It's neither simple curiosity, nor trouble-shooting. Harlei: But the map on the right doesn't show any "sfy". Anyhow, those maps show that a sizeable fraction of the population of Ooranye must, at any one moment, be engaged in survival-test journeys, to determine whether or not they can reach their destinations, in order to feed the cartographers' insatiable hunger for danger-statistics. Can you imagine any practice more likely to lead to adventure? The human natives of Ooranye, like those of Barsoom and Amtor, are real aboriginal natives of their world. No COMOLD let-down here: no ultimately alien origin. The Uranians evolved on Uranus, just as the Barsoomians originated on Barsoom. They are human like us because of convergent evolution, not because of any common origin. And this echoes their philosophy. Deeply rooted in the Uranian psyche is the teleological bias, that insists: "destinies trump origins". Where you're going is more important than where you came from. That's how the Uranians think, and their very shape suggests that they're right to do so. Teleology ->> convergent evolution ->> human shapes on many worlds, from Valeddom to Barsoom to Ooranye. Stid: All this is very well, and I agree that the Uranian mentality is properly thought-out and linked to the setting and the stories. But (to be candid) one aspect of this particular book seriously puts me off: the so-called "Brief History of Ooranye". A lengthy, terrible drag. Once we get onto the stories, I'm fine, but as for that History... oh brother. How can one possibly keep track of all those names and events and eras? Harlei: It's only for reference, Stid. I don't think you're meant to read it all in one indigestible lump. Zendexor: I don't know whether you're expected to read the History as a whole or not, but you certainly don't need to. Look at it this way. 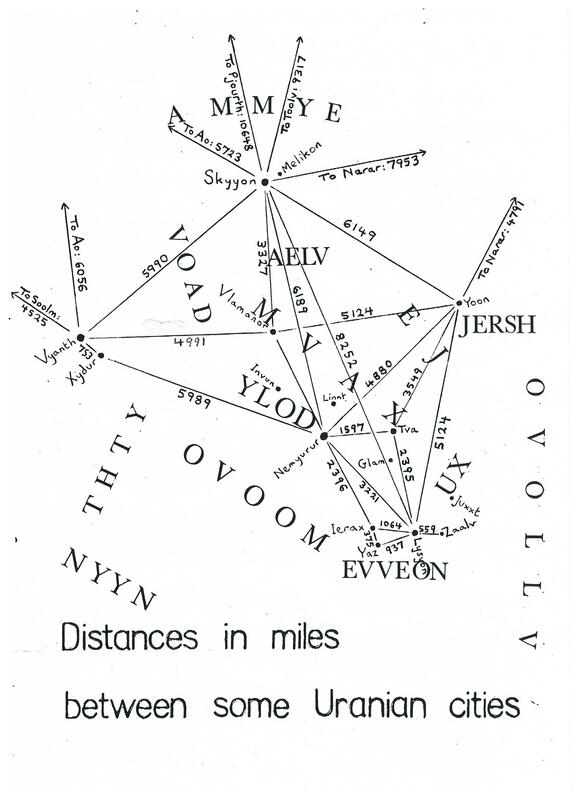 If Burroughs had written a comparable historical guide to Barsoom, would we not be glad to have it? Even if it were no more digestible than (say) the Silmarillion, or that essay by Robert E Howard on The Hyborian Age which you'll find reprinted in some Conan collections. My advice to readers: try the first couple of chapters of the History, and if it's not your cup of tea, don't go on obstinately ploughing through 100-odd pages of stuff which you won't remember. Waste of time! Instead, go straight on to the "Gleams" - that's to say, the adventures. And after you've read those stories you might then want go back to some relevant bits of the History, and read them in a different way. For more adventures set on Ooranye, see the following: Uranian Throne, serialized in Tales to Astound; and Uranian Thule, in the OSS collection Vintage Worlds (2018), edited by John Michael Greer and Robert Gibson. For the unisex pronoun "nen" see the OSS Diary, 27th and 28th September 2016. For the reality-change of the "Fostering of Ooranye", see the Diary, Planetary Change. Acknowledgement: The Uranian Eras table has been offered free by the author from his website. Extracts: Uranian Rail Network - Dream of a polar palace on Uranus.